One of the country’s oldest newspapers has made the switch to compact format after 240 years as a broadsheet. The Hampshire Chronicle, which was first published in the reign of George III, celebrated its move to the smaller size yesterday by publishing a 124-page edition. 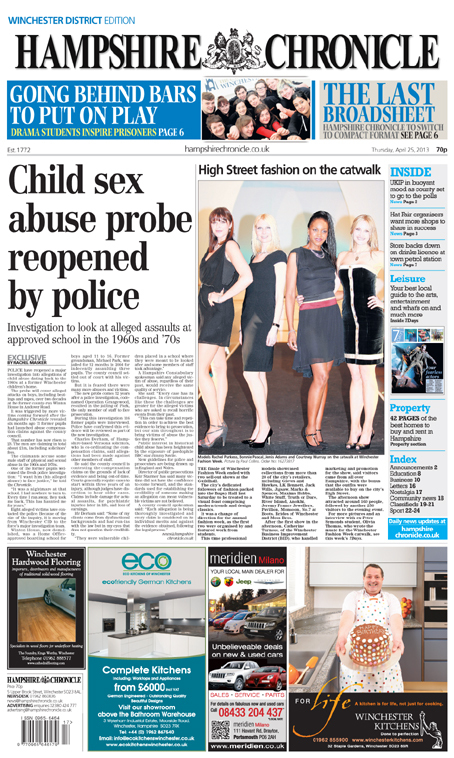 The Newsquest-owned weekly comprised an 88-page news, sport, and pull-out leisure guide, together with a 36-page property section which has remained broadsheet. However the format change was also accompanied by a cover price increase of more than 40pc, from 70p to £1. 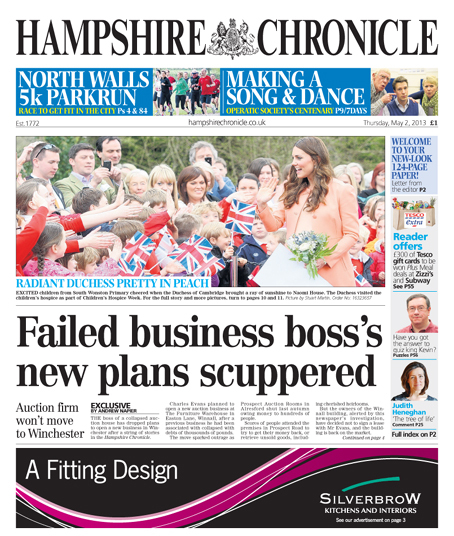 The newl-look compact version of the Hampshire Chronicle which hit the newsstands this week. Editor Keith Redbourn told readers the decision to switch to compact had followed a number of reader surveys and focus groups. “The decision to change from broadsheet to compact was not taken lightly. Indeed over the last few years we have commissioned a series of focus groups, street surveys and spoken with many of our regular advertisers to garner opinion,” he said. “The feedback in all of our surveys has overwhelmingly supported the move to compact. Keith told HTFP that early reader reaction to the change has been overwhelmingly positive. “It was important to get the look just right by improving the design and content in a way that wouldn’t look too different to what had gone before. I think we achieved our aim,” he said. “Incredibly, one comment we received was that we’d gone up market, and that it looked just like The Times! On the cover price increase, Keith said it reflected the decline of traditional advertising revenue streams. “Many of the advertising sectors which have effectively subsidised quality local journalism over the years are receding, and if we want to maintain standards and provide coverage which is high in quality, comprehensive, and independent then we must charge a realistic price,” he told readers. The broadsheet version of the Chronicle which has been laid to rest after 240 years. Good old Newsquest, less product for more money! So the first compact edition is 124 pages, lets see how many pages they publish after the first few months is over? I also imagine the “overwhelmingly positive” feedback mentioned by the editor came from the offices of the Newsquest Southern senior management who seem to excel at mutual back slapping.